(ORIGINAL OWNER) LOOK NO FURTHER, THIS 2018 SEA RAY L550 FLY BOASTS ALL OF THE MOST SOUGHT AFTER OPTIONS AND IS THE ONLY ONE AVAILABLE IN FRESHWATER AT THE TIME OF LISTING -- PLEASE SEE FULL SPECS FOR COMPLETE LISTING DETAILS. LOW INTEREST EXTENDED TERM FINANCING AVAILABLE -- CALL OR EMAIL OUR SALES OFFICE FOR DETAILS. Freshwater / Great Lakes boat since new this vessel features Twin Caterpillar C12.9 850-hp Diesel Engine's (Note Digital Switching w/Custom Sea Ray Interface & Tablet Control, Caterpillar 7" Color Display) with only 105 original hours (Note Optional Joy-Stick Docking Control Coupled w/Bow/Stern-Thruster.) Notable features include but are not limited to the following: Air-Conditioning & Heat (Zone Controlled Throughout Vessel), (2) Head's (Vacuflush) w/Vanity/Sink/Stall-Showers), Vacuum System, Washer/Dryer, Bow & Stern Thruster's, Onan 21.5kw Generator w/Sound-Box, Raymarine Electronics Package (VHF Marine Radio, 2-Raymarine Axiom 12.1" Color LCD-Display's w/Radar/GPS/Chartplotter/Sounder, Raymarine Autopilot), Premium Fusion Sound System w/Bluetooth & Remote Wired Controls, Polished Stainless Steel Anchor w/Windlass & Forward Pedal Controls (Note Anchor Locker w/Freshwater Washdown), Hydraulic Swim Platform w/Remote Control, and MUCH more! 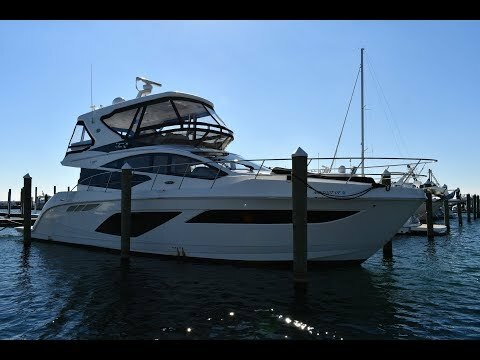 Broker Notes: Notable individual options .. Polished Stainless Steel Anchor, Networked Fusion Sound System, Digital Satellite TV-System (KVH TracVision HD7 w/Receivers for all rooms), Teak Cockpit / Bridge Steps, Joy-Stick Docking, High-Gloss Wood Exterior Tables. Inside heated winter stored. Highly recommended by listing agent!